Pretty Little Liars was not a show I intended on enjoying. I have no knowledge of nor have I ever read the series of books. I have enjoyed the series so far. Here's my review of The Complete Fifth Season DVD. 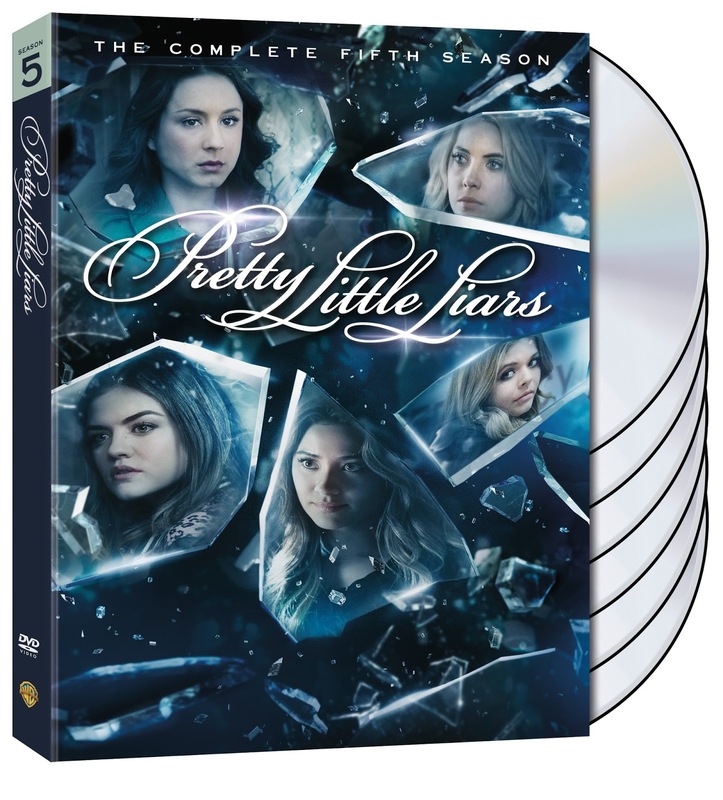 The hit ABC Family series Complete Fifth Season DVD set includes all 25 episodes on a 6 disc set. Some pretty cool special features I highly recommend checking out. I enjoyed quite a few story lines this season had to offer. First off, THAT cliffhanger ending to Season 4. I love Ezria, a bit too much I did not like Ezra leaving us at the end "Who shot Ezra". On a happier note I love that we get the return of Caleb coming off the now canceled Ravenswood. Bringing together Hanna and Caleb once again. Which I heart so much, one couple has to be happy in Rosewood, right? I did enjoy how Aria's brother Mike turns very dark and does his own spy(having been dating Mona). It was very creative and super creepy.The Mona/Alison battle continues on. I love the conflict between them. So juicy. The girls loss of trust in Alison was no surprise to me. How long can someone trust a girl that would put you in the way of "A" for day one. As the season goes on the gang go "full Scooby" and start to investigate the real truth behind Ali's story---could she be "A" is looking more likely to the girls. The girls are trying to solve a whole lot from who killed Mrs D., Bethany Young,(sigh)Mona. Which is a pretty cool twist. Which is fun to see when/how Mike goes dark. (BTW) Bethany is the girl that was found in Alison's grave, which was the reason for Spence being a suspect for awhile. I don't really care for Toby being a member of Rosewood PD now. It has changed him--not sure for the better or worse. You be the judge. So finally, after all of the pieces are put together the girls find that Alison is NOT "A" nor is she responsible for Mona's death. Shocker right? Hanna being the good honest girl wants to tell the cops, of course "A" kills those plans. As usual. PLOT TWIST Hanna is arrested as being an accomplice in Mona's death. Shortly after, Alison is charged with crime along with Aria, Emily and Spencer are charged as accessories. I loved the holiday(Christmas) episode--lots o' eye candy.It was a fun lighter moment of the episode. The girls getting all dolled up for the winter ball. I know I don't fit the demo for Pretty Little Liars but it's been so fun to watch the past 5 years. The key to the shows HUGE fan based it the witty, creepy and solid writing. Kudos to them! Seriously, you can be scared one moment then laugh out loud the next. Let's not forget the always awesome OMG moments...remember when we ALL thought Toby was "A" in the season 3 SHOCKER!?!. My mind was blown! Special features are a hit-or-miss in my book. We Love You To DeAth* Which is a my personal favorite which features the actors answering fan questions. **It originally aired as a stand-alone episode back in October 2014. Don't forget to watch the deleted scenes you just might see something you missed. Get your copy now in stores as of June 2, 2015.